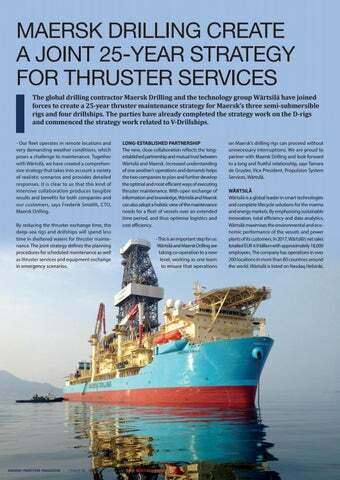 MAERSK DRILLING CREATE A JOINT 25-YEAR STRATEGY FOR THRUSTER SERVICES The global drilling contractor Maersk Drilling and the technology group Wärtsilä have joined forces to create a 25-year thruster maintenance strategy for Maersk’s three semi-submersible rigs and four drillships. 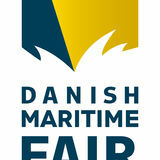 The parties have already completed the strategy work on the D-rigs and commenced the strategy work related to V-Drillships. - Our fleet operates in remote locations and very demanding weather conditions, which poses a challenge to maintenance. Together with Wärtsilä, we have created a comprehensive strategy that takes into account a variety of realistic scenarios and provides detailed responses. It is clear to us that this kind of intensive collaboration produces tangible results and benefits for both companies and our customers, says Frederik Smidth, CTO, Maersk Drilling. By reducing the thruster exchange time, the deep-sea rigs and drillships will spend less time in sheltered waters for thruster maintenance. The joint strategy defines the planning procedures for scheduled maintenance as well as thruster services and equipment exchange in emergency scenarios. on Maersk’s drilling rigs can proceed without unnecessary interruptions. We are proud to partner with Maersk Drilling and look forward to a long and fruitful relationship, says Tamara de Gruyter, Vice President, Propulsion System Services, Wärtsilä. WÄRTSILÄ Wärtsilä is a global leader in smart technologies and complete lifecycle solutions for the marine and energy markets. By emphasising sustainable innovation, total efficiency and data analytics, Wärtsilä maximises the environmental and economic performance of the vessels and power plants of its customers. In 2017, Wärtsilä’s net sales totalled EUR 4.9 billion with approximately 18,000 employees. The company has operations in over 200 locations in more than 80 countries around the world. Wärtsilä is listed on Nasdaq Helsinki.